Keeping Up With the Kapenga's: One Busy Girl! It's hard to believe that summer is over, especially since today is supposed to be 80 degrees! Jenna has been making the most of the nice weather we've been having. 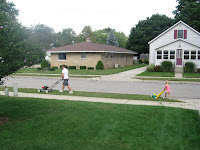 She loves to help mow the lawn which is usually done with a push mower....she just trails behind. 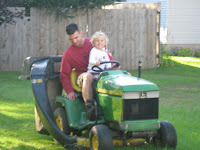 Last week Dave had to mow at our duplexes so he stopped by with the rider and Jenna got to help, she LOVED it! She even wanted to help my mom the next day with hers and before long my mom thought she felt a little limp and heavy and sure enough Jenna had fallen asleep! Riding her bike has come second to running everywhere for most of the summer (I wish I had a video of her "running"...it's hilarious). But suddenly she took an interest and wants to ride everywhere. 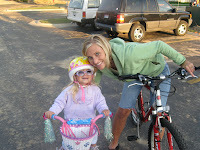 We even made it from our house all the way to Captain Sundae and back...a long enough ride for little legs. Uncle Travis gave Jenna a tool set for her birthday and she has really been putting it to use. She helped Dave last week put some gutters on the house and when my car made a funny noise they though they better take a look. Here's Jenna tightening some bolts...or so we let her think.